The first litter of pigs was born the night before last. When I did the evening chores I figured she would have them that night. She was building a nest, had milk, and was a little grumpy. She didn't have a great litter. Only four survived birth, four were dead. But for a first time mother she is doing a great job with the ones she has. So far she has been very careful and attentive with them. All together we have 3 gilts, but I don't think one of them is bred. 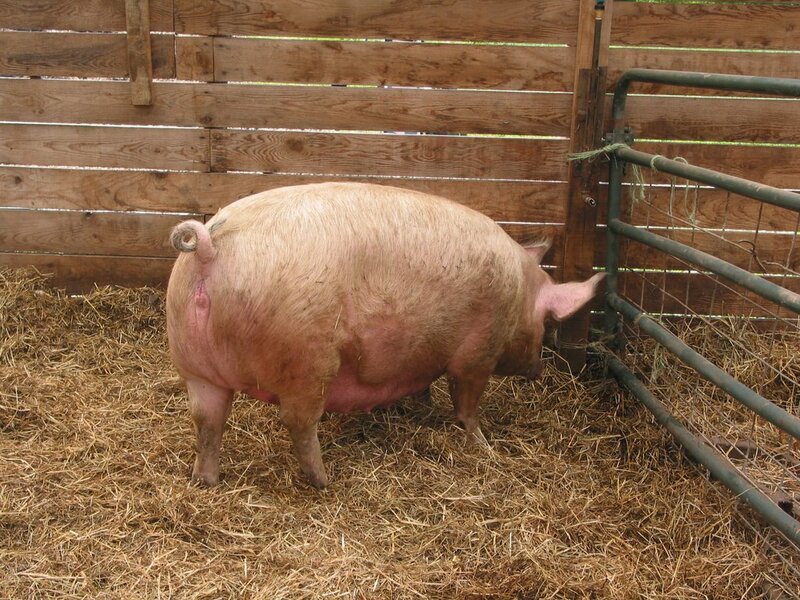 The other one (in the picture) is probably about a week off of farrowing. 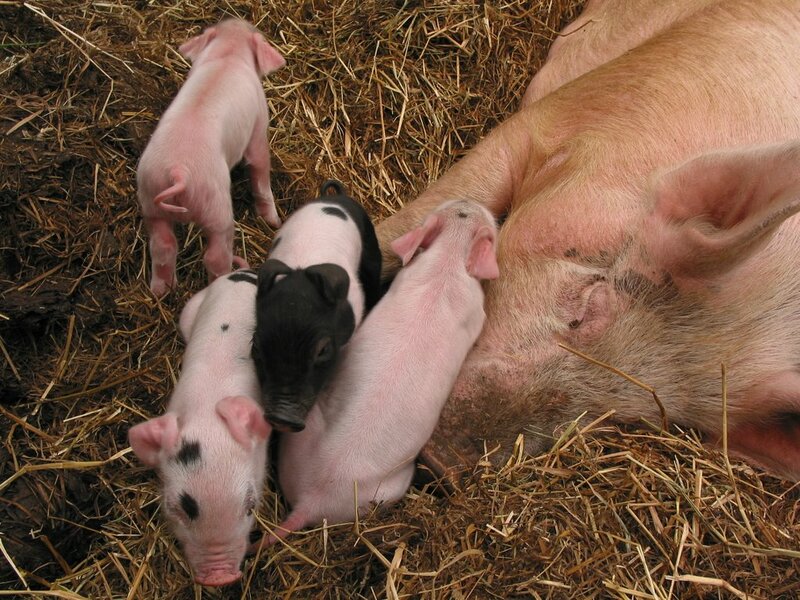 I let the boar and gilts live together as one big family, so I don't actually know the breeding date for any of them. We are beginning to feel the less meddling we do in our livestocks affairs the better. If we give them the things they need to be successful at what they want to do naturally, they will generally rise to the occasion. I spent a few hours watching the new momma pig farrow and she didn't have any live ones while I was there. The four that made it were born after I went to bed, so obviously she was able to handle that without any help from me either. We try to intervene only when there is a problem. Around here we spend all winter longing for Spring grass. It always starts in slow, kind of like the tide coming in, and then all of a sudden there is a tidal wave of grass. 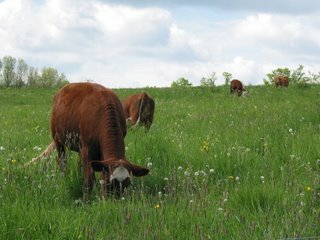 We manage our pastures/hayfields using rotational grazing. What that means is that we subdivide the pastures and only give the livestock access to enough for 1 day. We have 4 or 5 sets of portable temporary fence which we keep moving to form the next paddock, leapfrog style. This time of year it is impossible to keep up with the grass so we end up reducing the amount of ground that we pasture and let some of the farm go for hay. 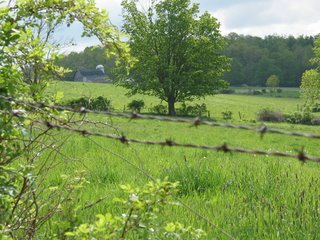 After the first cutting of hay the grass is generally starting to slow down and the cows can keep up with it. It isn't a flawless system but most years it works very well to keep the grass eating livestock well fed all year.